Can Kat and Harper catch a spy? Fast, fun, engaging read with a great mystery and strong characters. Kat’s mom is an overworked, underappreciated vet who barely has time for her daughter. When circumstances lead her to quit on the very day their apartment is burglarized while Kat is home alone, Dr. Wolfe takes the opportunity to look for her dream job where she’ll have veterinary work she can feel passionate about again, reasonable hours, and more time and happiness to share with Kat. Little does she know that her choice will lead them both to a supposedly quiet and idyllic seaside town, a vet practice with some very strange customers, a reunion with deliberately lost family, and an international mystery complete with spies and multiple murders. Kat is quite taken with their new town, new house, and new pet, Tiny, a large F1 Savannah. It will take all of Kat’s animal whispering skills to befriend the cat, and she relishes the challenge. But she has hardly started when she is sidetracked by the first customer of her pet-sitting business disappearing. It’s up to Kat and her new friend Harper to uncover what’s happened with Ramon, because no one else believes them, not even the police chief. Harper has been sidelined since she fell off her horse, the Pocket Rocket, and broke both her legs. Harper partners with Kat, lending her hacking to the mystery. Can they find Ramon and solve the mystery of the Ghost Owl? There is so much to love in Kat Wolfe Investigates. There are strong female characters, strong adult characters with brains (so rare in books these days), redemption, spies, and decently realistic kid hackers. I loved that all the characters had their own unique voice, skills, and each did heroic deeds in their own way. This might have read “it takes a village to solve a mystery.” I also loved that the kids and adults supported and cared about each other so much. The mystery was intelligent, well-plotted, and had a James-Bond feel that will appeal to a wide audience. 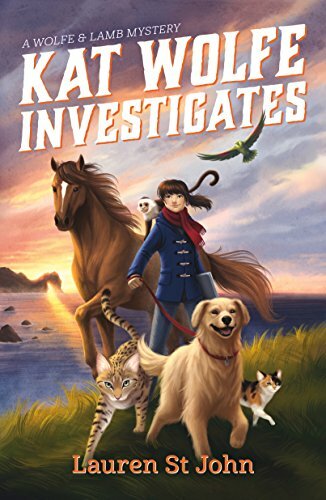 Highly recommended for middle-schoolers, parents, and those who love middle-school fiction, as well as mysteries, spy novels, and animals.